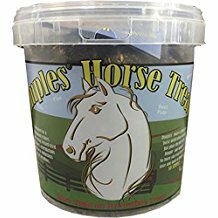 Healthy horse treats made with 8 whole grains including ground flax and beet pulp. 3# bucket. Soft and pliable with a "dimple" in them making administering medication to your horse so easy! These are great. Make it so easy to give horses pills. Sons horse had 20 stitches in eye lid and also put on antibiotics. No wondering if she got pill down and she loves them. These are wonderful.